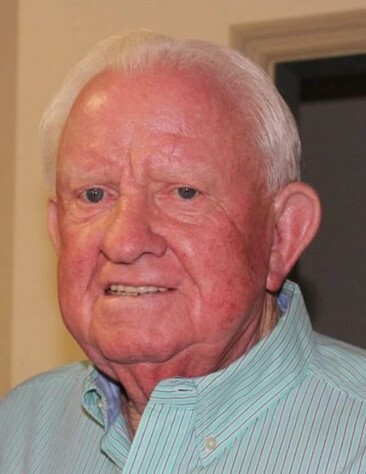 Quinton Wayne Mullis, age 80, of McRae, died Tuesday, January 15, 2019. Funeral services will be held on Friday, January 18, 2019 at 1:00 p.m. in the chapel of Vaughn Funeral Home in McRae. Lay-minister Norwood Davidson and Bill McKinnon, Sr. will preside over the service. Interment will follow in Telfair Memorial Gardens. Mr. Mullis was born in Cadwell and raised in Laurens County. After graduating high school, he played minor league baseball for a short time. He was a member of the McRae Presbyterian Church, a 33 year retired employee of Georgia Power Company, past Woodman of the World field representative, Citizens Bank Board of Director for the Helena Branch, past City of McRae Mayor, a 55 year Helena Masonic Lodge #536 Master Mason, a member of the McRae, Hawkinsville and Fort Valley Al Shriner organizations, a member of the McRae Correctional Facility Community Relations Board, McRae Correctional Facility Community Relations Liaison and past City of McRae Auxiliary Police. Mr. Mullis was named 2008 Telfair County Chamber of Commerce Man of the Year, Telfair Exchange Club Book of Golden Deeds Recipient, named Woodman of the World Outstanding Citizen, coached McRae and Helena Coca Cola Little League baseball and was an avid sportsman. He was preceded in death by his parents, Judson David Mullis and Eddie Mae Smith Mullis Dixon; his son, David Wayne Mullis; one grandson, Charles Veazy Eckles, III; five brothers, Woodrow Mullis, Judson David Mullis, Jr., Ralph Andrew Mullis, Fred Mullis and Graden Mullis and one sister, Doris Mullis Moye. Survivors include his wife, Martha Ann Mullis of McRae; two daughters, Cindy Eckles (Chuck) of Eastman and Cathy Davis (Johnny) of Dublin; five grandchildren, Candice Ogden of Atlanta, David Ogden (Amber) of Cleveland, Callie Eckles of Buckhead, Charles Eckles, IV (Emily Stanko) of Marietta and E.J. Davis (Thu) of Vietnam; one brother, Tommy Mullis of Melrose, Florida and three sisters, Katherine Mullis Zackary of Macon and Louise Mullis Colter and Almaleen Mullis Stuckey both of Dublin. Serving, as pallbearers will be David Ogden, Charles Eckles, IV, Kent Tokar, Kory Tokar, Lon Hamilton, Roy Hamilton, Lee Coody, Billy McKinnon, Michael Schlenz and Tim Towns. In lieu of flowers the family requests donations be made to the McRae Presbyterian Church, PO Box 55567, McRae-Helena, GA 31055; Abraham Baldwin Agricultural College Foundation, ABAC 13, 2802 Moore Highway, Tifton, GA 31793 to the David W. Mullis Scholarship; American Cancer Society, 804 Cherry Street, Suite A, Macon, GA 31210 or the Heart of Georgia United Way - Red Cross Division, P.O. Box 857, Dublin, GA 31040. All donations should state, “In memory of Quinton Mullis”.